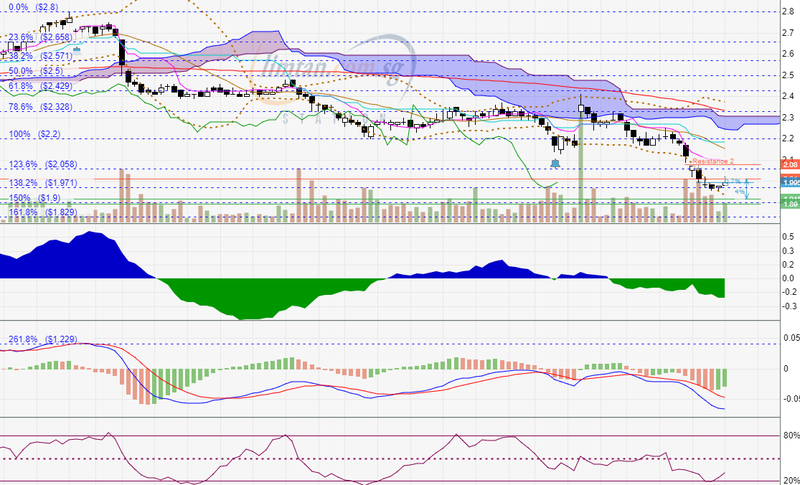 It has been a long time since I shared a technical analysis (TA) here in ASSI. I used to do a lot more TA when I was trading more actively but I have not been trading as much for quite a while now. Alamak. You don't believe me? Why? AK is lazy? OK, you win. Anyway, since I haven't done this for a while, I am probably rusty. Looking at the chart, it should be obvious that the trend is down. However, what is more noteworthy is that the downtrend is a strong one. There is no sign of any positive divergence as the MACD has formed a lower low and so has the CMF. Money is still flowing out of the stock and chances of a trend reversal at this point are slim. Today is a white candle day but it is a short white candle with an upper wick of equal length which suggests that Mr. Market wasn't a very enthusiastic buyer. Although with all the selling pressure, some people say ComfortDelgro is oversold, the MFI shows that the stock is yet to be oversold. Yes, the bleak picture could get worse. Are you vested at much higher prices and don't have balls of steel? OK, stop reading now. Short sellers are probably having a field day here and any half-hearted recovery in share price would probably be seen as an opportunity to short sell. The strong downtrend could see the support provided by the 138.2% Fibo ($1.97) broken. It was merely punctured but recovered last week. We could see the 150% Fibo at $1.90 tested then. If that goes, the 161.8% Fibo at $1.83 is next. These are golden ratios and are theoretically stronger support levels. If these supports were to break, more blood will flow on the streets. OK. What if this does not happen? Alamak, remember that TA is about probability, not certainty. What time frame is your chart based? -_-"
I often use Bollinger Bands with RSI for intraday/short-term trades and only recently exploring fibonacci retractment for entry price which i find pretty useful for my long term positions. Alamak, I cropped out the dates... -.-"
TA can be a bit dangerous because the uninitiated might think it is a crystal ball and that is one reason why I haven't been sharing much TA. All current indicators doesn't represent a uptrend or even a sideway trend. Better avoid till some sideway trend start appearing. It does look like there is more pain in store for investors of ComfortDelgro. I always say that what TA does is to provide us with a glimpse of Mr. Market's psyche. Hi AK, pls make the chart zoomable cos the size is too small. Thanks. I fixed this by choosing a larger size for the chart. Right click and open the image in a new tab. Quote: "Jialat hopefully its a horror story, yester had 7 million value shorted but price still went up...."
Well, Mr Market probably saw this post and so down it goes today. After reading your blog, I have been waiting to invest in Comfort. I don't have a big war chest like you. So, I need to buy at a lower price. With the latest bad news, do you think the share price will plunge next week? Although it is in a downtrend, I do not know for sure if the share price will plunge or not next week but I think I know where the supports are if the share price should decline. Thank you for your generous sharing. I actually missed out on CDG, but went onboard with some Singtel and Wilmar instead. So now I am re-reviewing CDG and hopefully gain more insights for future stocks. The is no need for exactness in TA. I always say that it is an approximation. hi Sir, are u still holding on to ComfortDelgro or looking to take profit? your advice is appreciated thanks alot! "These are golden ratios and are theoretically stronger support levels. If these supports were to break, more blood will flow on the streets. TA is about probability, not certainty. If it does not happen, then, treat this as a horror story lor."